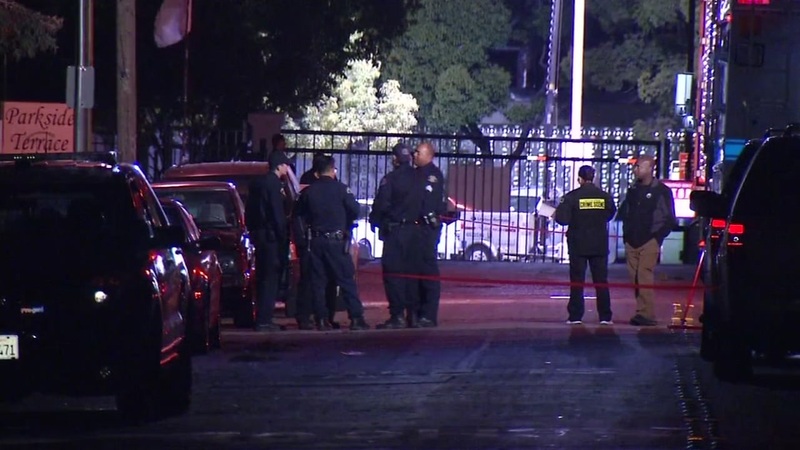 SAN JOSE, Calif. -- Two officers shot at a man who rammed a stolen car twice into an occupied patrol vehicle in San Jose early Tuesday morning and remains at large, police Chief Eddie Garcia said this afternoon. Tuesday's officer-involved shooting was the first captured on the department's new body-worn cameras and has helped in the investigation, but won't be released to the public, Garcia said during a news conference outside police headquarter this afternoon. 2 San Jose police officers open fire after man crashes 2x into cruiser w/ officer inside. Three officers on foot patrol in the 400 block of Wooster Avenue west of U.S. Highway 101 heard over the police radio that a stolen car was heading their way shortly after midnight, he said. One of the officers who had just entered his patrol vehicle saw the stolen car with the suspect driver, who quickly changed gears and backed up into a cul-de-sac, Garcia said. The officer attempted to conduct a high-risk traffic stop on the suspect, who didn't comply and drove head-on into the patrol vehicle. The suspect then moved the car in reverse, crashed into a parked semi-trailer truck and drove again into the patrol vehicle, Garcia said. In defense of the officer in the vehicle, the two other officers fired at the suspect driver, who fled the scene, Garcia said. The stolen car was found empty about a mile east in the area of McKee Road and El Rancho Verde Drive a short time later, according to Garcia. Officers and K-9 units searched the area, where they took a man who was hiding into custody without incident on a misdemeanor warrant for resisting arrest, Garcia said. Investigators later determined the man they had in custody wasn't part of the earlier shooting and booked him into Santa Clara County Main Jail on the warrant, Garcia said. The suspect driver was described as a man between 20 and 30 years old. He hasn't been found as of this afternoon, the chief said. It doesn't appear the suspect was injured after officers checked with hospitals. There were no reports of anyone who walked into their facilities seeking treatment for shooting-related injuries, according to Garcia. The officer involved in the crash was left with a minor injury to a lower extremity. The officer was transported to a hospital and then released, the chief said. The officer has been with the department for two years, while the two officers who shot at the suspect have each served for about three-and-a-half years, Garcia said. All three officers were placed on paid administrative leave, he said. Tuesday's incident was one of five officer-involved shootings this year. The Police Department's homicide unit has launched a criminal investigation that will be monitored by its internal affairs unit along with the city's Office of the Independent Police Auditor and City Attorney's Office. Anyone with information on the case is asked to call police Detective Sgt. Pat Guire or Detective Todd Jennings at (408) 277-5283. Those who wish to remain anonymous may call Silicon Valley Crime Stoppers at (408) 947-7867.